Rubiana is by Rubignon (Rubinstein I/Donnerhall/Pik Bube) and was bred by Split Mesquite Farm. Beautifully uphill, wonderful expression. Sangria Sunrise was born May 9, 2013 and is by Sagnol (Sandro Hit/Landadel) and out of our beautiful mare, Lugana. Gran Tango is our first colt by Gran Casso born at Split Mesquite Farm. 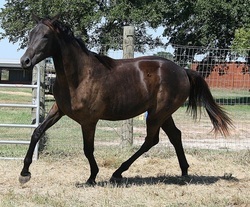 He is out of Zarina, a Dutch Warmblood mare by Contango. We couldn't have asked for more in a colt. Powerful, expressive with a fantastic temperament!